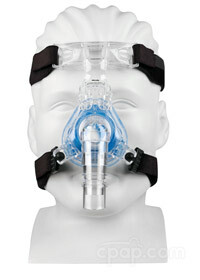 A CPAP mask is the delivery system used to receive the air stream generated by the CPAP or BiPAP machine. The mask should be comfortable and seal completely without leaving red marks on the face. There are a wide variety of CPAP masks available in several different styles offering CPAP users many options from which to choose. Mask type categories are shown above. 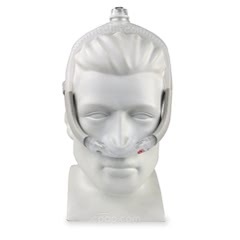 A CPAP mask creates an airtight seal around the mouth, nose, nostrils, or both the mouth and nose; allowing the pressurized air to travel from the CPAP machine to the airway. 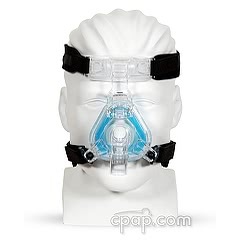 A CPAP mask isn't just important, it's essential. 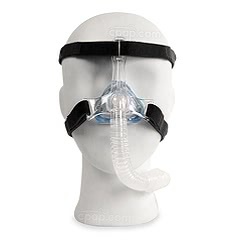 It's crucial to the long term success of CPAP therapy, so making sure someone has the correct mask is a very important part of CPAP treatment. Nasal: This type of mask covers the nostrils completely and is designed for people who breathe through the nose. Nasal Pillow: This type of mask seals at the base of each nostril, and is intended for people who breathe through the nose. Nasal pillow masks do not cover the bridge of the nose, and are typically more minimal and lightweight in design. Full Face: Full face masks cover the mouth and nostrils, and are intended for individuals who breathe through the mouth during sleep. Some modern full face masks are designed to avoid covering the bridge of the nose, and instead seal under the nostrils. 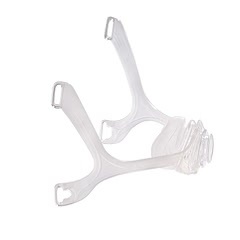 Nasal Prong: Penetrates the nostrils with prongs, and is designed for individuals that prefer the nasal pillow concept but can't get effective treatment with just nasal pillows. Oral: Seals inside the mouth, and does not cover the nose. This type of mask is rarely used. Hybrid: Covers the mouth, and uses a full set of nasal pillows. Designed as an alternative to a full face mask and is the most popular of the lesser-purchased mask types. Total Face: Covers the entire face, and is only used when no other mask will work, or air is leaking out of the eyes. How do I stop mask leaks? Air leaks can be caused by masks that are too big, too old, or simply the wrong style. Air leaking into the eyes is usually an indication that the mask is too big (long or wide) as are leaks at the base of the nose. Leaks may also occur under the nose due to facial hair. As the silicone in the mask cushion ages, it deteriorates and becomes too soft to hold a seal. For many masks, the cushion may be removed and replaced to extend the life of the mask. View our Replacement Part Finder to see if a replacement cushion is available for your mask. When a cushion has softened to the point where it will no longer hold a seal, you may be able to tighten it enough to stop the leaking when you go to sleep, but during the night the seal will loosen and leak. Mask leaks may also be caused by the pillow pushing against the mask and changing the position and seal of the mask. There are special CPAP Pillows which are are designed to minimize the contact of the CPAP mask with the pillow, even when you are sleeping on your side. What Might be Wrong When the Mask Will Not Connect to the Hose? If a new mask will not connect to the hose, it could be a sign that the swivel or elbow from an old mask may be stuck inside the tube. Often, the swivel or elbow which extends from the mask can become lodged in the hose after use. Collect the hose to compare against the product page details on CPAP.com. 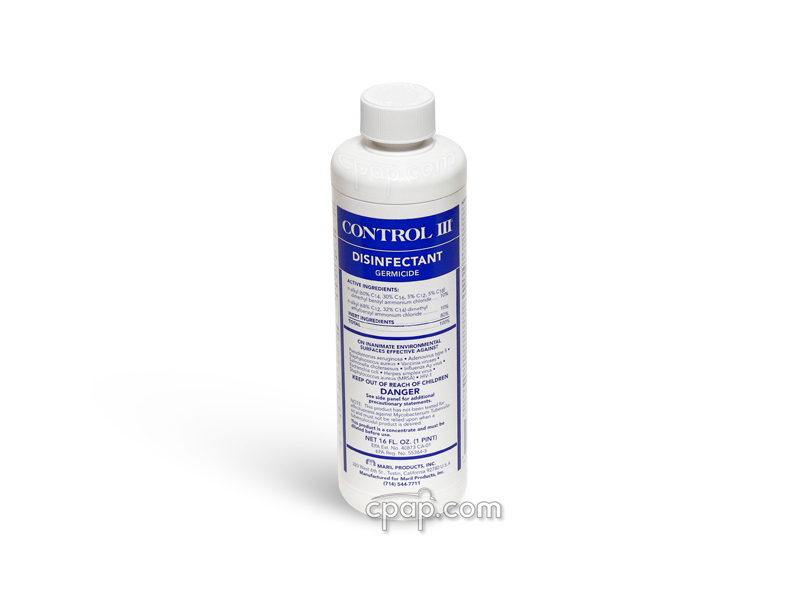 Open the product page to review images that correspond directly with the hose. The end of the hose should not have an additional piece protruding from the connecting attachment. If there is a clear piece that seems to be integrated into the hose, pull to remove the segment. Open the product page to review the replacement parts that correspond directly with the mask. Locate the swivel piece as a replacement part to compare. If the elbow is not attached to the mask as demonstrated on the site, the swivel or elbow may have become lodged in the tube. What is the Most Comfortable Mask? The most comfortable CPAP mask is going to depend on a lot of factors based on personal preferences. Which style works best for each person will depend on how he or she sleeps. Mouth breathing? A full face mask may be best. Breathe through the nose? A nasal mask or nasal pillow mask may work the best. Want a wide-open field of vision? A mask without a forehead support may work the best. Keep in mind, it's not unusual for someone to try a few different masks before finding one that's the most comfortable. 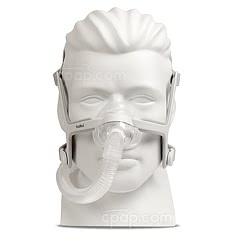 Many different manufacturers have developed masks that are designed to address common customer complaints with CPAP therapy. There are masks designed to minimize the feelings of claustrophobia. There are also masks designed for active sleepers, and even masks that make it easy to read or watch TV. Before purchasing a mask, it's important to know what features matter the most and go from there. Why Does My CPAP Mask Whistle? Air is leaking out the sides of the mask because the mask isn't sealing properly. Vented air from the top of the exhalation port is causing the noise. Perhaps the diffuser isn't working properly. The most common reasons for whistling sounds are often the presence of leaks. When a leak happens, the pressurize air escapes, and in the process it can cause vibrations in the silicone or gel which can cause whistling. Mask leaks are common, and they're easy to fix. Simply adjusting the mask can often reduce or eliminate the whistling sounds. If that doesn't work, it may be advisable to use a CPAP Mask Liner to help create a better seal and make the cushion more comfortable. The exhalation port is usually found on top or sides of the mask, and it's how the mask vents carbon dioxide. If the mask seal is fine, and no air is escaping from the mask around the edges, then it could be the case that the exhalation ports aren't working properly and need to be replaced. 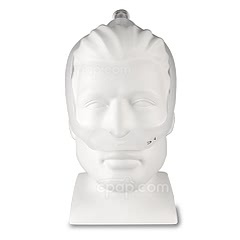 CPAP masks are mostly universal, meaning they will work with almost every brand of machine with one notable exception. The AirMini AutoSet Travel CPAP Machine is designed to work with a small handful of ResMed CPAP masks. 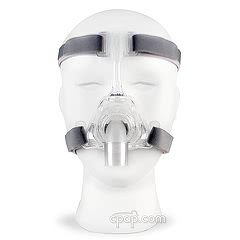 Otherwise, CPAP masks are universal, meaning they will work well with every machine. This is possible because most hoses use standardized connectors at the point the hose connects with the mask, and masks are designed to fit within these connectors. CPAP masks are not intended to last for years, and are designed to be replaced on a fairly regular schedule. CPAP masks should be completely replaced once every 6 to 12 months. CPAP masks are worn every night, and take a lot of abuse during wear. The goal is to create an airtight seal, while at the same time keeping a person healthy. Over time, human oils can begin to break down a mask cushion; the headgear gets stretched out; the frame can crack, and the experience gets less and less comfortable. This is why regular replacement of a CPAP mask is an important part of CPAP therapy. How Do I Stop My CPAP Mask from Leaking? Sometimes leaks can happen as the result of changes in body position or pressure setting (as sometimes happens with an APAP machine). A person could shift in position, and the mask can press on the bed pillow with enough force to cause the seal to break, creating the leak. With APAP machines, the pressure output is variable and the machine can select any setting from 4 - 20. If the headgear isn't tight enough, and the machine selects a much higher pressure than what it was when the night began; it can cause the seal to break in the middle of the night. Most of the time, simply adjusting the mask headgear straps will be good enough to stop a leak, and in the case of a leak from APAP pressure increases, it will most likely fix the issue. For leaks that happen because of a bed pillow, it may be time for a specially designed CPAP bed pillow. These pillows are built with cutouts designed to accommodate a CPAP mask, so shifts in position don't impact the seal of the mask. 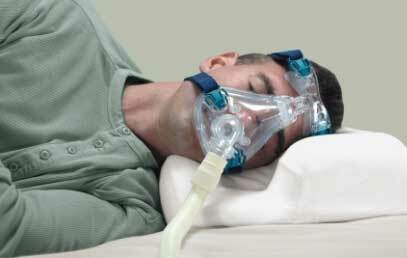 CPAP bed pillows help prevent recurring mask leaks, and are intended to help keep the user asleep longer. Human oils like sweat can sometimes create a small space between the mask and the skin. Over time, human oils can also break down the silicone, making it more difficult to get a seal. If you notice the CPAP mask slipping, it may be time to replace the cushion of your mask, and that may go a long way to helping fix the seal long term. Another possible solution would be to invest in a mask liner, which is designed to absorb most of the oils and make the mask seal better and less likely to slip. For men with beards, the hair creates a space where air can possibly escape, so it can take some extra planning when purchasing a mask. Try to get something that doesn't cover the upper lip if possible. This would preclude nasal masks and some types of nasal pillow masks. Full face masks, if you can tolerate them, are going to be the best option. It can also be helpful to wear a mask liner, as this can help create a better seal. Mask leaks can be annoying, but the good news is they're mostly easy to fix! Following a few simple steps can go a long way to improving the fit. How do I Clean My CPAP Mask? 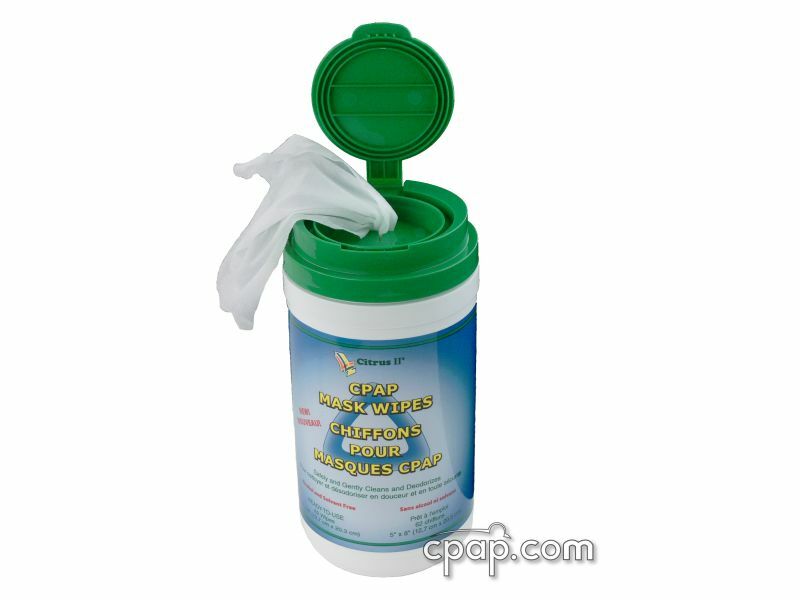 A CPAP mask cushion should be cleaned daily. It should be cleaned with mild soapy water or Mask Wipes. Make sure to gently scrub the inside of the cushion, and remove any dirt or debris. After cleaning, dry the inside of the cushion with a cloth. The frame can be cleaned in a similar way. 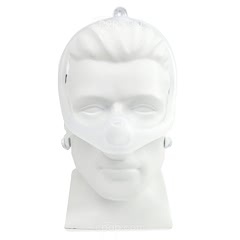 The CPAP mask headgear should be washed weekly with warm water and mild soap, and allowed to air dry completely before being used again. 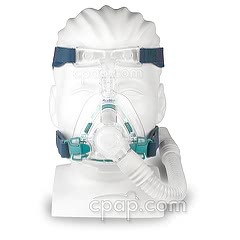 A CPAP cleaning machine like the Lumin CPAP Sanitizer can also be used to sanitize the mask. 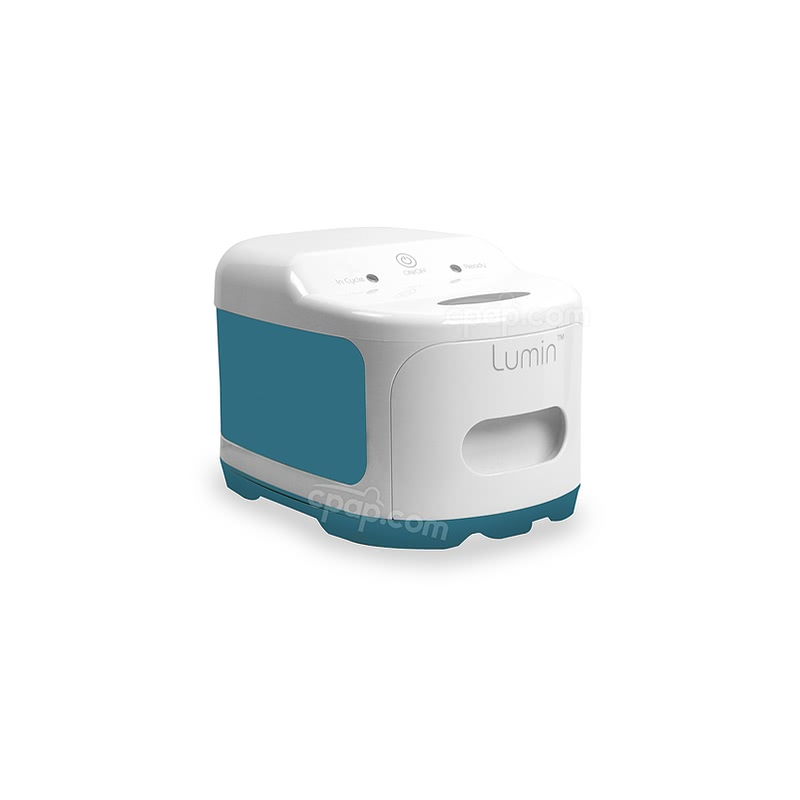 The Lumin uses sanitizing UV light to kill 99.9% of all germs. Some additional scrubbing may need to take place after sanitization to remove any deposits, as the cleaning machine can't do this. Can You Recycle a CPAP Mask? CPAP masks are often made up of hard to recycle materials (like silicone), and even though some parts of the mask are made of plastic, it's not the same kind of plastic commonly found in water bottles. This means it's not a good idea to put a used CPAP mask in a recycling bin, as most of the parts are not easily recyclable. While there are organizations (such as the Reggie White Foundation and the American Sleep Apnea Association) that will accept used CPAP machines, neither organization will accept a used mask. This is largely done for health reasons. Used CPAP masks are a breeding ground for germs, and could easily make a new user sick. Sometimes recycling centers will accept masks on special days where they collect hard to recycle items, so it's important to call ahead to see if they accept these items. Different Numbers with Different Masks? You Betcha! If you are worried about sizing, select a mask with a fit pack so you know your size is in the bag! Every mask is compatible with every machine. If you experience nasal irritation, consider alternating between your nasal pillow system and your nasal mask.